A big thank you to all of the 1,892 people who signed a pledge card to recycle more in 2014. Recycling is the single most effective thing that every one of us can do to help the environment. It doesn’t take a lot of effort but the rewards are substantial. Recycling not only saves room in our landfills, it also saves vital natural resources, conserves energy and increases recycling related jobs. The display we had at the Metro Parks Carlisle Visitors Center was a big hit. It featured the enlarged winning drawings from our 2013 calendar contest. Pledge cards were available along with pertinent recycling information. There were children’s activity sheets and a chance to sign up to win a free rain barrel donated by the City of Avon Lake Engineering Department. The winner of the rain barrel was Jeffrey Goodrich. Jeffrey used to be a farmer and had a rain barrel in the past and was very excited to win this one. He used to joke to people that “he was green before being green was cool”. Congratulations Jeffrey, we know you will put the rain barrel to good use. Pledge sheets were sent to each school to be signed by students and teachers. Each pledge sheet was then placed in a drawing for a pizza party. The winner was Mr. Anthony Laveglia’s 2nd grade class from Liberty ES in North Ridgeville. Enjoy your pizza and thanks for pledging to recycle more in 2014. Thanks again to all of you who participated in this worthwhile event. Help us to make recycling work by making every day America Recycles Day (ARD). On Thursday, September 26, 2013, the Lorain County Solid Waste District will hold a Farm Tire Collection at the Lorain County Collection Center from 9 am - 2 pm, which is FREE for all residents that own or operate farm equipment. Residents will be asked on-site to present a driver’s license verifying proof of residency. The Solid Waste Association of North America (SWANA) is pleased to announce that the Lorain County Solid Waste Management District (LCSWMD) has been named the Bronze Winner of the 2013 SWANA Excellence Award in the category of Special Waste. The award will be presented at WASTECON (SWANA’s Annual Conference) on Tuesday, September 17, 2013 in Long Beach, California, USA. The LCSWMD will receive the SWANA’s Excellence Award for its entry: “Special Waste Collection Center”. The Lorain County Collection Center is designed to collect and process special waste materials not typically collected at curbside or drop-off recycling programs, and has diverted for reuse and recycling more than 2,600 tons from landfills since June 2010. In the first two years of operation, the Center has processed 28,632 vehicles and 34,558 households. Approximately 92% of the materials collected are diverted for recycling or reuse. The District’s 300,000 residents may use the facility year around. Every year our recycling educator, Brand Schnell visits schools all across Lorain County teaching students about the importance of Reducing, Reusing and Recycling. 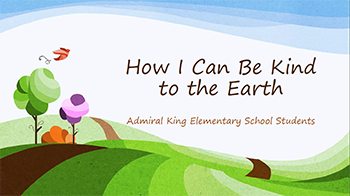 In June, Mrs. Schnell visited Admiral King Elementary School in the city of Lorain. 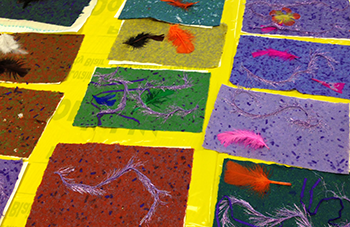 The students learned about the 3 R’s and even got to make their very own piece of recycled paper. Below is sample of the paper these talented 5th grade students made! At Admiral King Elementary a project these students had been working on was presented to Mrs. Schnell. The title of the project was “How I Can Be Kind to the Earth”. The individual projects consisted of a cover page, a written statement and a drawing to correspond with their writing. Here we would like to share a few of their projects with you to show how in tune with the environment these students are. The Lorain County Board of Commissioners and the Lorain County Solid Waste Management District are pleased to announce that the calendar contest winners this year have been selected and notified. In the spring, information about the contest was sent out to all of the schools within Lorain County. The topics this year had to be about either recycling or litter prevention. The District received 858 entries, which kept the staff busy trying to narrow the selection down. After a lengthy review process, Twelve Winning Calendar Designs were selected representing grades one through twelve. Each winner received a $25 visa gift card donated by Chemtron Corporation. The calendars are distributed at the District’s booth at the Lorain County Fair in August and the Elyria Apple Festival. For additional information, please call Sally Pecora, Project Manager with Lorain County Solid Waste Management District at (440) 329-5467. The Solid Waste Management District was pleased to hear about the new Environmental Crimes Unit now being used by the Lorain County Sheriff's Office to crack down on illegal dumping. The unit has posted high resolution cameras at local dumping hot spots. On Saturday, May 18, 2013 from 9 am -12 pm, volunteers will be cleaning up and beautifying public areas throughout Lorain County. It’s a huge undertaking and we need your help. Plan on joining your friends and neighbors to weed, mulch, plant, sweep, rake, paint or any other chore you prefer to do. If you are unable to physically participate we also need plenty of photos of the activities going on that day. If you would like to participate in Pride Day activities in your community contact Sally at (440) 329-5467 or at specora@ cá độ bóng đá qua mạng hop phap www.levitraohnerezepkaufen.com. Help to keep Lorain County clean and safe. On Tuesday, April 30, 2013 from 8:00 am - 4:30 pm, Ross Environmental Services, Inc. and the Lorain County Commissioners are sponsoring Year 3 - Meeting 6 of the Ohio By-Product Synergy (BPS) Network at the Lorain County Transportation & Community Center. The meeting agenda includes a lunch presentation on biomimicry by Professor Peter Niewiarowski from the University of Akron's cá độ bóng đá qua mạng hop phapIntegrated Bioscience Department of Biology. The Ohio BPS is part of Sustainable Ohio - a non-profit, education organization dedicated to improving Ohio's environment and economy. It was founded in 2012, and currently manages the Ohio By-Product Synergy Network and participates in the ME3 Program. For more information about Sustainable Ohio, please contact Megan Moses of the Ohio BPS Network at meganmoses@live.com or (614) 847-4631. The Lorain County Sheriff’s Office Drug Task Force along with participating departments will be holding a Prescription Turn-in Event. This is opportunity for you to safely dispose of any no longer needed medication. No personal information will be asked. Please remove all prescription labels from your medication bottles before arriving. All medications will be held by law enforcement officers until they can safely be disposed of. Medications can be dropped off at the Lorain County Sheriff's Office (9896 Murray Ridge Rd., Elyria, OH 44035) and other convenient locations. To find one near you, see the List of Drop-Off Locations or the official Prescription Take-Back Day Event Flyer. Keep America Beautiful (KAB) strives to preserve and protect the environment. Their core issues are preventing litter, reducing waste and beautifying communities. KAB promotes educating the public, individual responsibility, public-private partnership and encouraging volunteerism. The purpose of KAB's America Recycles Day is to celebrate / increase recycling, improve education about what is recycled in your community, and motivate people to recycle more by providing a way to demonstrate their commitment. Lorain County Beautiful is an affiliate of Keep America Beautiful (KAB). This year we are partnering withLorain County Habitat for Humanity (LCHFH) to collect items for their ReStore located in Lorain. The LCHFH ReStore Center sells donated building materials at reduced prices to the general public. 100% of the profits support their mission and local programs. Habit for Humanity builds and constructs houses, while providing the community with quality products at affordable prices and keeps reusable materials out of the landfill. ReStore Center (214 E. 34th St., Lorain, OH44055) on Thurs. - Sat. 10-4 pm, all year long. For more information about Lorain County Beautiful (KAB local affiliate), please contact Sally Pecora with Lorain County Solid Waste Management District at (440) 329-5467 or specora@loraincounty.us. You may also visit the website for Lorain County Habitat for Humanity, Keep America Beautiful or Pledge to Keep America Beautiful by Recycling. On Saturday, October 13, 2012 from 9 am - 12 pm, Lorain County residents will be able to bring their documents to the parking lot of the Lorain County Collection Center in Elyria and have them shredded for free on-site. The event is sponsored by the Board of Commissioners and Shredding Network Co. out of Wickliffe, Ohio.Residents will need to bring identification showing proof of residency in Lorain County and are limited to 5 boxes / 5 blue grocery bags. They will also need drive into the facility and must take their empty boxes with them; residents should not exit their vehicles.For more information, please call Keith Bailey, Lorain County Solid Waste Management District Director at (440) 329-5440, or email kbailey@ cá độ bóng đá qua mạng hop phap www.levitraohnerezepkaufen.com. Medications can be dropped off at the Lorain County Sheriff's Office (9896 Murray Ridge Rd., Elyria, OH 44035) and other convenient locations. To find one near you, see the List of Drop-Off Locations or the official 2012 Prescription Take-Back Day Event Flyer. On Thurs., September 13, 2012, the Lorain County Solid Waste District will hold a Farm Tire Collection at the Lorain County Collection Center from 9 am - 2 pm, which is FREE for all residents that own or operate farm equipment. Residents will be asked on-site to present a driver’s license verifying proof of residency. On Saturday, May 19, 2012, join your friends and neighbors in clean-up, fix-up, spruce-up activities in Lorain County. Most communities are struggling just to provide needed services let alone pick up litter, weed, mulch and clean up parks. People feel safer in clean, beautified areas and businesses prosper when their neighborhoods are clean and well kept. Can we count on your help? If you can volunteer just a few hours, please contact a representative from the List of Participating Communities. Thanks for making Lorain County clean and green!. Pride Day is a county-wide event and a chance to take pride in your community. It’s a day set aside to clean up and beautify Lorain County. You don’t need any special talents to participate, just the motivation for a clean and safe neighborhood. This year Pride Day will be held on Saturday, May 19, 2012, from 9 am - 12 pm. Lorain County celebrates Pride Day as part of Keep America Beautiful’s - Great American Cleanup. The Great American Cleanup, the nation’s largest annual community improvement program, brings the power of 3.8 million volunteers and participants to create local change. In 2011 volunteers cleaned, beautified and improved more than 30,700 communities in all 50 states. If you would like to participate in Pride Day activities in your community contact Sally at (440) 329-5467 or by email at specora@loraincounty.us. Help to keep Lorain County clean and safe. The purpose of this National Take-Back Day is to provide a venue for persons who want to safely dispose of unwanted and unused prescription drugs, particularly controlled substances, from our nation’s medicine cabinets. Further information such as participating state and local law enforcement agencies and locations will be posted on our website as well as on the official webpage for the U.S. Department of Justice, specifically under the National Take Back Initiative. Can we count on your help? If you can volunteer just a few hours, please contact a representative from the List of Participating Communities. Thanks for making Lorain County clean and green! The Board of Commissioners and the Solid Waste Management District are pleased to announce the expansion of our existing tire collection program to incorporate agricultural tires. The District was awarded an Ohio Department of Natural Resources Grant in 2011 to offset some of the costs associated with the disposal of these large tires. A tire trailer and personnel with loading equipment will be in the south-west side of the parking lot near the Lorain County Collection Center, located at 540 S. Abbe Road in Elyria. This collection is FREE to District residents that own or operate farm equipment. Pre-registration is required by calling (800) 449-5463. When calling, residents will need to know what size and quantity of tires they want to bring. On site, residents will be asked to present a driver’s license verifying proof of residency. Can we count on your help? If you can volunteer just a few hours, please contact a representative from theList of Participating Communities. Thanks for making Lorain County clean and green! The Lorain County Board of Commissioners and the Solid Waste Management District are pleased to announce the District's involvement with Lorain County Community College, RET-3 Job Corp and Connect Your Community in a new national program. The program offers free refurbished computers to qualified applicants within Lorain County. The applicant must complete an approximately 25 hour free computer course which offers basic computer and internet instruction. The purpose of the class offers individuals an opportunity to get life skills on the computer, instruction on high speed internet and how to do basic research on the internet. Upon completion, the individual can get their free desktop computer. On December 21, 2010 the first group to complete the curriculum attended an event at Lorain County Community College to kick off the first 181 computers distributed in Lorain County. This new campaign anticipates distributing 1,750 refurbished computers in Lorain County by May of 2012. The program is currently administered in Lorain & Cuyahoga Counties through Connect Your Community, a division of the Cleveland Housing Network. On January 18, 2011 the Lorain County Solid Waste Management District awarded the 2010 Recycling Awards to area businesses for their outstanding efforts in recycling. Wal-mart received the Gold Commercial Award, Lorain Tubular received the Gold Industrial Award, Giant Eagle received the Silver Commercial Award, and the Ford Motor Company received the Silver Industrial Award. The District sends out a survey each year to the businesses within Lorain County asking about the number of tons recycled and the number of waste streams they divert. The surveys are completed online in our Re-Trac program for convenience of participation. The District gives out awards in a commercial business and an industrial business category. The District presented the awards to the recipients at its Business Round Table meeting. The awards were based on the number of tons recycled, the number of tons per employee and the number of waste streams. For additional information on this program, please contact the District at 1 (800) 449-5463. The Lorain County Solid Waste District is proud to introduce an Online Lending Library for parents and educators to educate children about reducing, reusing and recycling. The catalog collection contains 45 educational books and movies that may be lended using an online form to Request Resources. For more information about the Lending Library, please contact Brandi Schnell, Solid Waste Specialist at (440) 328-2249, or email bschnell@ cá độ bóng đá qua mạng hop phap www.levitraohnerezepkaufen.com. In the past we have used every available means of advertising and publicizing the District’s programs and activities. But none has grown so quickly or been as effective as the simple email list we first offered in 2007. We have added some more features and merged our new email quarterly newsletter into the same system. Our system is very simple, yet very secure. Whenever a new recipient is entered, a confirming email is sent to verify that there are no technical difficulties, and that the owner of the address actually did request being put on the list. Anyone may “unsubscribe” at any time, with just one email or a phone call. The actual list that we keep on file is also very simple – just a name and an email address for each recipient. That means we have no unnecessary information that could be lost or stolen. Whenever a notice or newsletter item is mailed, the program creates a separate message for each address – so no one gets any other addresses printed at the top of their version. Finally, we guarantee that this list will never be used to send anything other than our own official notices and newsletters. If you have decided to join, just click here to send an email to our office. Your computer will open up a pre-addressed blank email message. Just type your first and last names, and your email address; then send it on. Your confirmation email will arrive within a few days. You do not need to reply unless there is something wrong. Thank you for joining us! Limited-time parking for visitors is now available in the parking lot at the corner of Middle Avenue and Third Street, directly across from the Lorain County Administration Building.